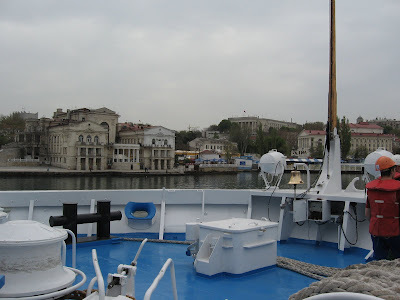 After leaving Kherson, our cruise crossed the Black Sea and in the morning we pulled into the port of Sebastopol in the Crimean penninsula. 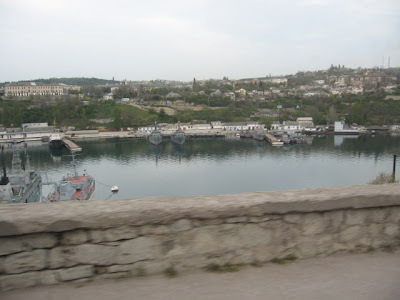 Sebastopol is the home port of the Russian Black Sea fleet, which was divided between Russia and the Ukraine after the fall of the Soviet union, but Russia still mantains its fleet here by agreement, and Sebastopol was closed to foreign visitors until 1996, mainly because they didn't want people like ourselves strolling into Balaclava Bay taking photos of the Russian submarine fleet in dry dock... as seen below. If anybody were to tell me that someday I would be pointing my cameras at the Soviet sub fleet in Sebastopol, and snapping the kind of Man-From-U.N.C.L.E pictures that would normally get you sent to Siberia for a long, cold vacation, I wouldn't have believed them. Nobody even tried to stop me. Heck, I'm not even allowed to take photographs in Newark Airport... sheesh, things have changed. Sebastopol was a beautiful port city, built in classical old style, which is amazing since it was almost entirely destroyed by the Nazis in WWII - only ten buildings in Sebastopol remained undamaged after WWII. 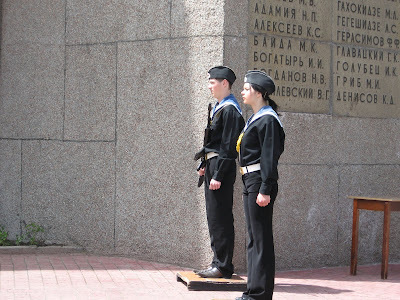 Our arrival on May 7th coincided with the beginnings of Soviet Victory Day celebrations, and there were naval cadets at the Victory Monument at the center of town. 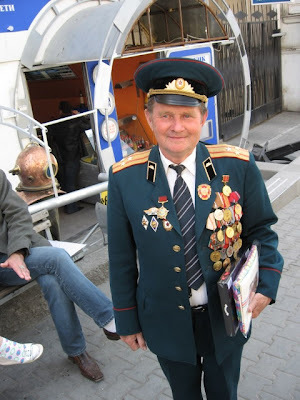 Veterans were walking around proudly wearing their medals, and we met one old sailor who spoke to us in rapid fire Russian that I could not understand, except for the words "Khruschev," "Kennedy," and "Cuba." He had been in the Cuban missile crisis, which I remebered as a kid because we had to evacuate New York and, as I remember, I was only allowed to take one toy with me... I chose my Tonka Dump Truck. So this was the guy that scared the poop out of us! But in the end he shook our hands and called out after us "Mir!" Peace indeed. 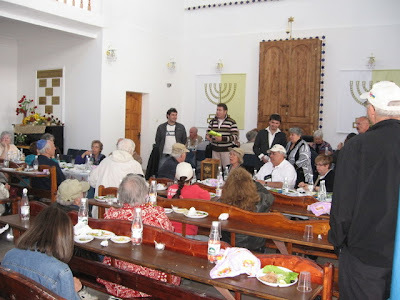 Our big trip was to the rather down at the heels town of Yevaptoria, where our delegation was to help in the dedication ceremony of new Torak scrolls at the Synagogue, which is undergoing rennovations. 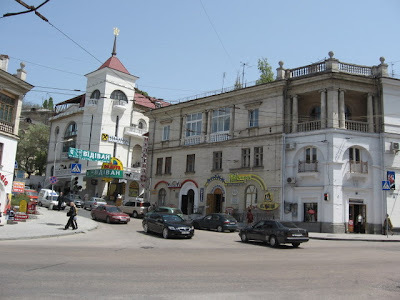 The congregation seemed to be a mixture of Ashkenazim as well as some local Krimchak Jews - who speak a Jewish version of the local Tatar language. After lunch at the synagogue we moved on to visit some of the other communities in Yevaptoria, including the Tatar Mosque (more on that later) and the unique Karaite Kenesa, the central house of worship of the Crimean Karaites. 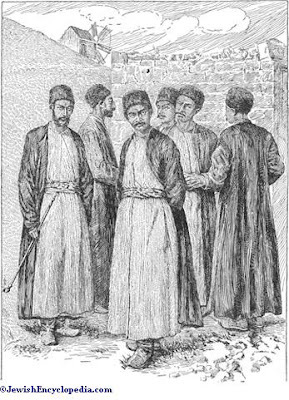 Karaites are an offshoot sect of Judaism that broke off in the period during which the Talmud was being writted in Mesopotamia, and adhered to a fundamentalist reading tof the Torah. Karaite communities existed in the Crimea with offshoots still surviving today in Lithuania, Poland (to a small extent) as well as in the United States and Israel (present home to the Egyptian Karaite communities.) 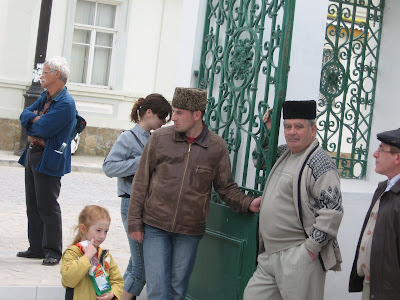 Turkic speaking Karaites (in the Crimean Tatar languagee, Qaraylar) have lived in Crimea for centuries. Their origin is a matter of great controversy. Some regard them as descendants of Karaite Jews who settled in Crimea and adopted a form of the Kypchak tongue. Others view them as descendants of Khazar or Kipchak converts to Karaite Judaism. Today Crimean Karaites deny their Israelite origins and consider themselves to be descendants of the Khazars. Modern Karaims seek to distance themselves from being identified as Jews, emphasizing what they view as their Turkic heritage and claiming that they are Turkic practitioners of a "Mosaic religion" separate and distinct from Judaism. On the other hand, many scholars state that the phenomenon of claiming a distinct identity apart from the Jewish people appears to be no older than the nineteenth century, when it appeared under the influence of such leaders as Avraham Firkovich. The Karaites are a people who are situated at, perhaps, the most sad and noisesome covergence of the debate on Jewish identity. 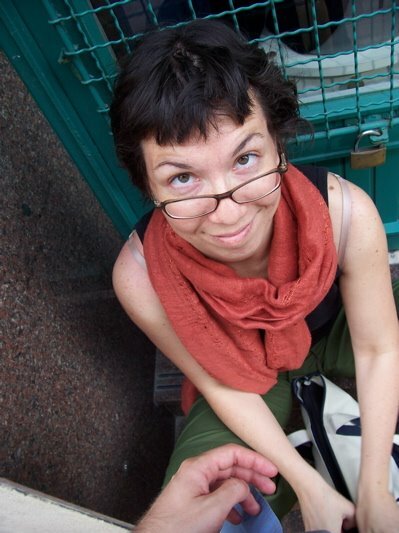 I used to be on a Karaite mailing list - it was the most nasty and contemntious email communication I have ever experienced and put me off of email lists forever. Essentially, the Karaites claim, as our guide told us, to be "practicsing Judaism, but not Jews." Which is pretty weird for people who are incredibly kosher, keep the Jewish calender, and were slaughtered in the Holocaust. 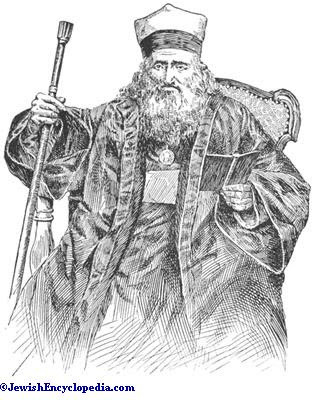 But in the mid 19th century, as Russian Jews were developing a written secular literature and its corresponding pursuit of history, the Karaites gave us Avraham Firkovich, a true piece of work, who played to Russian concepts of antisemitism, and while he was a respected scholar and Karaite leader in close touch with Russian Yiddishists such as Harkavy, was not above forging documents and even gravestones in his single minded pursuit of presenting the Karaites as non-semitic as possible. Firkovich was the first Jewish scholar to work on the discovery of the Cairo Geniza (which is mostly known through the work of Solomon Schechter.) 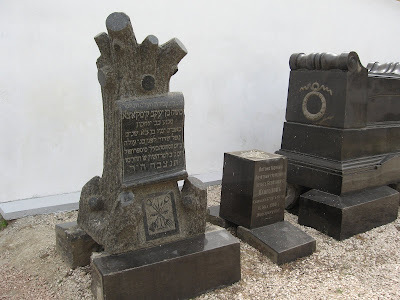 In Firkovich's later years, however, he became obsessed with "proving" that Crimean Karaites were not Judean in descent, but rather Khazar; to this end Firkovich resorted to forgeries of tombstones and documents. Because of this, any document that passed through Firkovich's hands is considered academically suspect. His theories, caught on in the Russian imperial court, and the Karaites were excluded from the restrictive measures against other Jews. The saddest pshat of the story... was related by Prof. Orenstein... just before the Holocaust, the Nazis consulted with three of the most respected Jewish scholars alive in Europe. The Nazis asked whether or not the Karaites were Jews. Knowing the fate of the Karaites if they answered correctly, all three scholars answered that the Karaites were most certainly not Jews. This bought time, but not much. The majority of the Karaites were murdered alongside the rest of the Crimean Jews, but to this day they maintain the ancient forgery-based fiction that somehow they are not Jews... As we say, if you were there with Moses at Mt. Sinai... you have dos pintele yid... the spark of all the Jewish souls that will ever be. And yes, the Karaites were there. They have the spark. The DNA testing done on Crimean Karaites shows that they have Semitic origins.It's sad that they believe the Turkic theory. The Urums also speak Tatar but aren't ethnically Turkic they are Greeks. 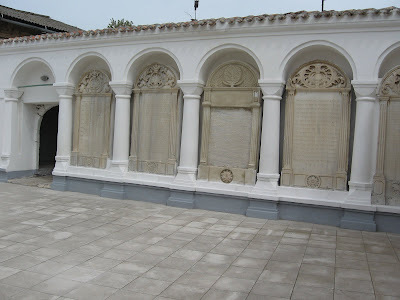 To philmwri, dumneazu, and other readers: Expanded results of the Crimean Karaite DNA study have been posted to http://www.khazaria.com/genetics/karaites.html and continue to show strong ties between Crimean Karaites and Karaites and Jews from other regions. Some Crimean Karaites today accept the truth of their Israelite origins and their deep family connections with the Karaites of Istanbul across the Black Sea. we definitely have turkic/asian origins, but also semitic origins. just how ashkenazim have european origins and semitic origins. @philmwri ...and who are the Greeks ?